Is your current pouching system right for your body type? Welcome to the Mayo Clinic Ostomy Surgery Page. An ostomy is a surgically created opening in your abdomen that allows waste or urine to leave your body. It takes time to become comfortable with an ostomy. Our goal is to connect you with others and provide you with information and support. Follow the Ostomy page to learn about ostomy care, read experiences of others and find resources for all your ostomy needs. Post a comment and share your thoughts. Our bodies change and with that sometimes our ostomy pouching system may need to change too. There is no one size fits all for everybody or every stoma. Gaining or lose of weight, abdominal surgery or even natural changes from aging can change our stoma and surrounding skin which can lead to a poor fit of a pouching system. 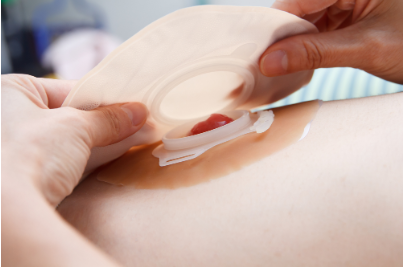 It is advised to have periodic reviews of your pouching system with your ostomy nurse to ensure consistent wear time and maintain intact peristomal skin. There are many pouching systems available including one- and two-piece systems. Skin barriers (the part attaching to the skin) comes in both flat and convex. As your body changes due to weight, surgery or aging, the skin barrier you choose may make a difference in your wear time. There are several considerations when deciding between a flat or convex skin barrier. Your ostomy nurse can help. He or she will start by examining your abdomen for the presence of creases or folds. If the area is flat in all positions, a flat barrier may provide a good fit. If there are creases or folds in the area, a convex barrier can help to flatten the creases providing a good fit. A second consideration for a convex barrier would be when a stoma does not protrude above the skin and the waste leaks under the barrier. Finding the most appropriate type of skin barrier and amount of convexity depth can be overwhelming. Your ostomy nurse will help with this. If you have any questions or concerns about the fit and wear time of your pouching system, please see your local ostomy nurse for help. Send an email to invite people you know to join the Ostomy page.